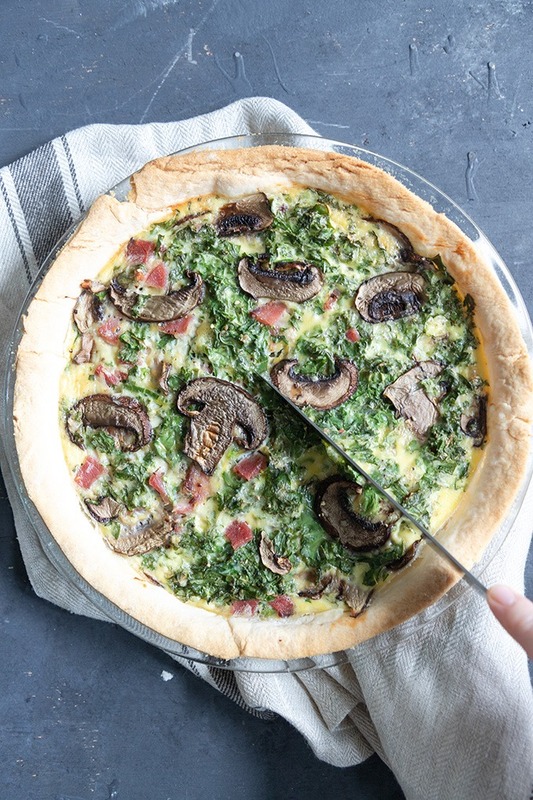 This simple quiche recipe aka lazy gal’s quiche is a great recipe to have on hand when you need to use up some fridge leftovers, or need a super quick recipe to make in a rush! Oh hey! Hows you’re Wednesday going? I’m kicking back in Australia and I must admit it’s pretty damn nice to have some sunshine! It’s been a while! We’ve just also been to New Zealand for a friends wedding which was absolutely gorgeous! It’s so nice to have a proper vacation for a change! Although I say ‘vacation’ I am still doing some sneaky work on the side because let’s face it, blogging rarely takes a break, but I did schedule a lot before I left so I didn’t have to spend too much time doing working while I was away! But enough chit chat, le’ts talk quiche! Are you a quiche fan? I feel like quiche is a very Australian/British thing, but honestly, quiche should be something the whole world knows! I never thought I’d be posting a quiche recipe, it seems just a touch old fashioned, but in the past 6 months, I have become a quiche convert! It is the EASIEST thing to make when you’re in a hurry, or when you have leftovers vegetables to use up! I love making one on Sunday for the weeks lunches, although mind you, this quiche rarely lasts a few days it’s that good! 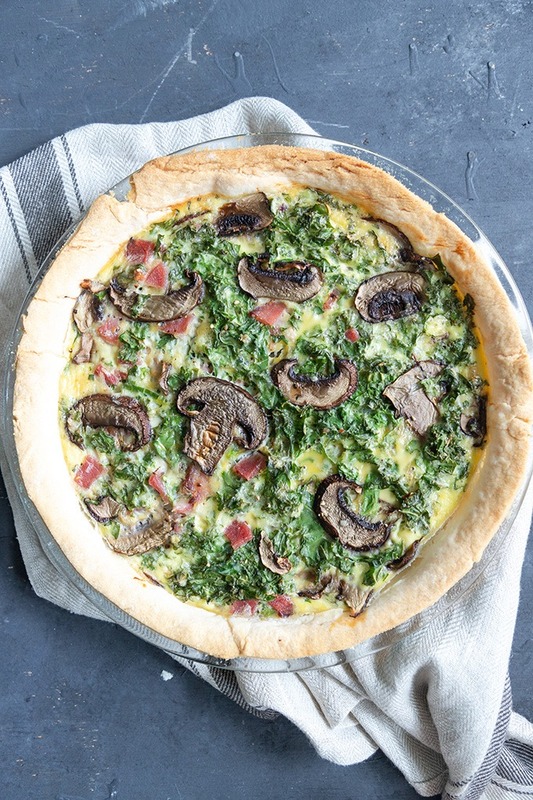 Why this Simple Quiche Recipe is the best! 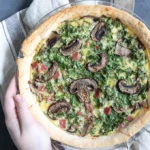 So I call this lazy gal’s quiche for a reason – it is SO easy and does take a few shortcuts here and there! Firstly, I used prerolled pastry – it makes things 10x quicker and easier and I actually find the flavour of storebought pastry comparable of homemade. This saves on so much time and means you’re quiche can be ready in 45 minutes or less. Secondly – there is no right or wrong way of making this! There are so many flavour combinations you can use depending on what you have already in the fridge. Today’s recipe is kale, mushroom and bacon, but I’ve made so many other flavour combinations before. Honestly, I could keep going. 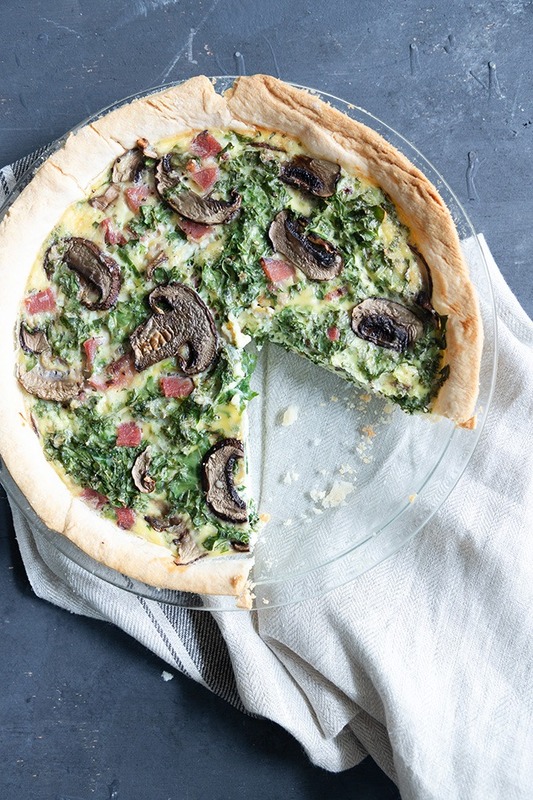 Basically what I’m saying, is that usually, anything works well in this simple quiche recipe! Aside from some fridge leftovers you’ll need a 9″/23cm shallow pie dish, some eggs, a little cheese and milk and some salt and pepper! That’s it! I told you it was easy! Serve with a salad, like my Israeli couscous salad, or Panzanella salad to make a full meal out of it! This would be the most perfect dish for Mother’s Day brunch, afternoon tea, or if you’re looking for a lazy healthy-ish dinner or dish for meal prep! 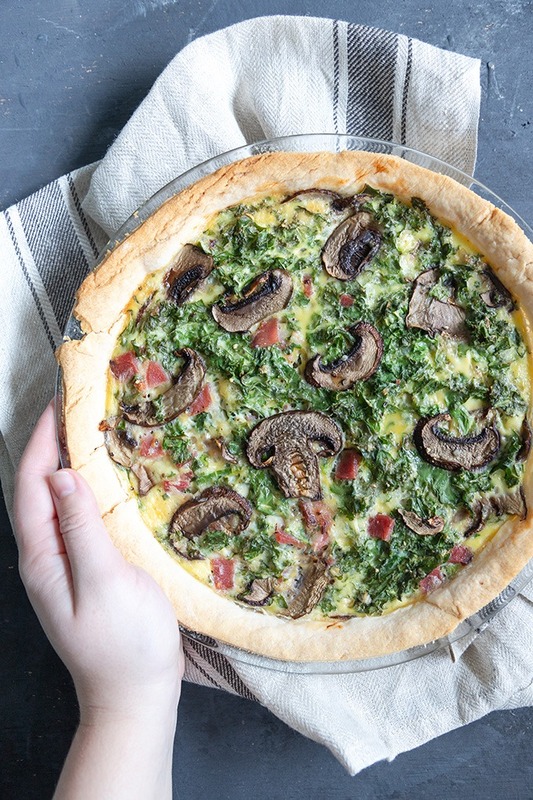 A simple quiche recipe that can be made using any fridge leftovers! Using rerolled pastry, this is a super quick recipe, great for a weeknight meal or afternoon tea party. Lightly grease a 9″/23cm pie dish with butter. Roll out the dough into the pie dish. Gently press the dough into the pie dish and cut off the excess overhanging dough. Combine eggs and milk in a large bowl and whisk together. Add cheese, bacon, mushrooms, kale, and salt and pepper. Whisk to combine. Pour the egg mixture into the prepared pan. Bake for 35-40 minutes, or until the centre is firm to touch and the edges of the pie crust are lightly browned. If you’re finding the crust is browning too quickly, cover the quiche with aluminium foil. Afraid you’ll miss a post? Subscribe today and receive updates on new posts, and bonus recipes and information! Follow along on Instagram, Facebook for food inspo and adventures, or see what I’m loving on Pinterest! And subscribe to my YouTube channel to find more fun recipe videos!